Ending a family walk through the sun-dappled woods of the Sussex countryside, we headed to the village shop for an ice cream, a reward for our exertions on the hottest day of the year. My son chose a bottle of Coke, the real thing, cold and misty from the fridge, thirst-quenchingly irresistible. I decided to have one too. I had never seen him look so concerned. You would have thought it was still the original recipe with coca leaves. I felt like a child asking for a glass of absinthe or some other inappropriate, drug-infused concoction. “How old do you think I am?” was all I could say. It must have been forty years since I’d last had Coca-Cola. We got through crates of the stuff in the local coffee-bar when “Happy Days” culture ruled the world, even in Yorkshire. We sat there through the autumn and winter months when we should have been working for our ‘O’ levels, making each bottle last an hour in the hope of being allowed to stay without buying another. The owner’s patience extended only so far as the table space. “We used to drink loads of it,” I remembered. My son frowned as I finished most of the bottle in one go. The distinctive spicy taste brought back memories of another walk, all those years ago, on Halloween, at the dead of night through the eerie gloom of the cemetery. Halloween was not for tricks and treats in those days. If noted at all, it was as a rarely-observed remnant of pagan, pre-Christian myths and legends: a night you might just dare mention ghosts and ghouls in jest. “All Hallows Eve!” someone said in the coffee bar. 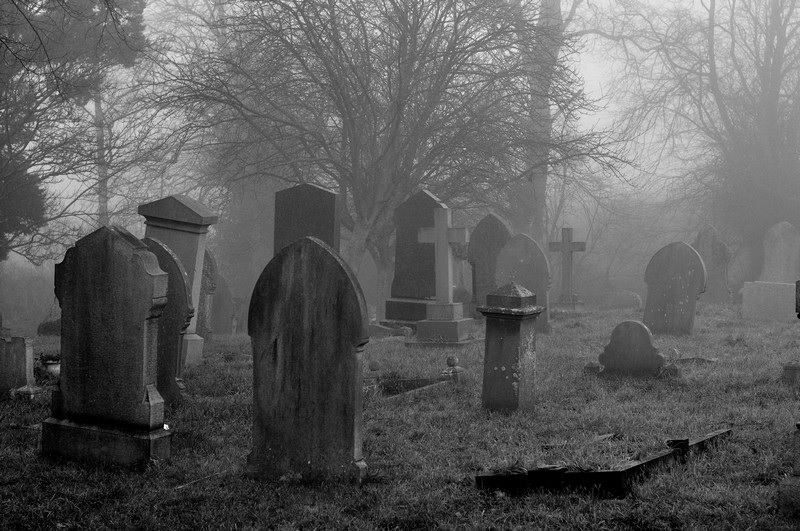 “You wouldn’t want to walk through the graveyard tonight.” Was it my idea, or Ron’s, or Neville’s? I am no longer sure, but none of us noticed Bill and Frank sniggering at the next table. The cemetery lay beside the river on a quiet stretch of road out of town. Neville, Ron and I made our way through the deserted winter streets, shoulders hunched, misty breath thickened by cigarette smoke, eyes firmly ahead, not seeing Bill and Frank surreptitiously following behind and then turning off. The iron gate opened with a heavy groan. We hesitated, then stepped into the blackness. Icy moisture dripped from trees. Footsteps echoed through the chapel arch. There were vague silhouettes, high gravestones, angels whispering omens of destiny, bent and broken wings, limbs writhing and twisting, stiff from decades of decay, grasping for us, reaching for our ankles, dragging us to their cold graves. The fog thickened as we neared the end of the cemetery. River mist. On top of the bank was a muddy track back to town. As we climbed, two floating spectral figures emerged above us and a chill voice spoke out in incantation. Neville froze like a gravestone effigy. I screamed in terror. Ron turned and fell down the bank. Bill and Frank, unable to keep up the pretence, broke down laughing, almost falling after Ron, their prize for shivering in the bushes. I looked at the empty bottle in my hands. It was plastic, thin, insubstantial, not thick and heavy like they used to be. The surface cleared as it warmed, and the mist evaporated like the mists of time. The vintage drawing of a Coca Cola bottle and the cemetery photograph are understood to be in the public domain. 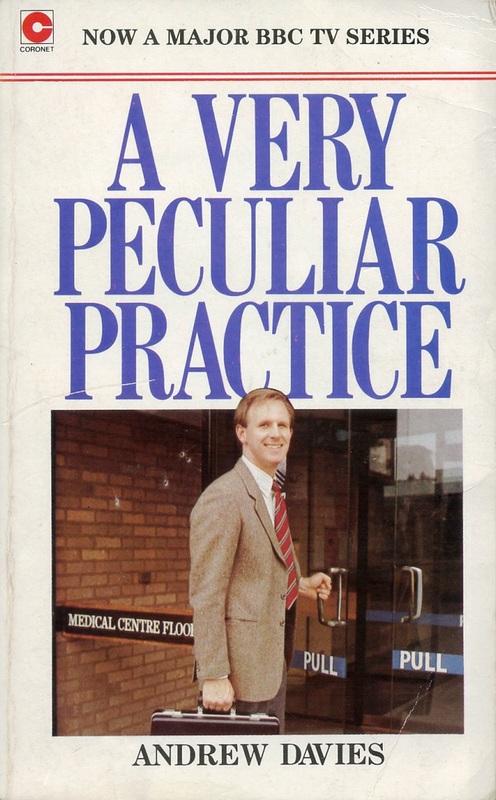 Continuing my interest in campus novels, A Very Peculiar Practice was originally a 1986 BBC television comedy series set in the health centre of a fictitious low-ranking university somewhere in central England. It was written by the prominent television writer Andrew Davies, and starred Peter Davison in the leading role as newly appointed young doctor Stephen Daker. I didn’t watch it at the time, but this book is the ‘novelisation’ of the seven-part series, with each chapter corresponding to an episode. Everything takes place to the background of short-sighted opportunism I recognise from my own university experiences: funding cuts; redundancies; bullying, the introduction of managerialism and business practices; the push for external funding while short changing the students. In other words, changing the nature of universities from being trusted guardians, creators and communicators of knowledge who provide a public service into dubious commercial outfits who rip-off customers and employees alike in order to maximise profits. If it was not for the values and ethos of the staff these things would have gone much further than they already have. The book is very much of its time, with nineteen-eighties sexist humour, predictable sitcom plots and stereotypical characters. The head of the practice is a going-to-seed drunken Scot. Another colleague is a self-seeking ruthless advantage seeker. A third is a bisexual feminist sexpot who sees everything from the women’s point of view. We also come across the high-achieving workaholic professor, the scheming vice chancellor and the impossibly perfect girlfriend. The central character feels completely out of his depth, but turns out of course to be far more up to the challenge than his lack of self-belief leads him to expect. Also, in a surrealist twist, there is a creative writer in residence who in discussing and thinking about his writing is actually discussing and thinking about the plot and characters of A Very Peculiar Practice. But if you can put up with all of this, then it’s an extremely funny book. fish, salamander, turtle, chick, pig, calf, rabbit and human. Professor Clarke stood at the blackboard with assured elegance. It was not just the beauty of his layout and lettering, it was the poise of his whole demeanor. Arm outstretched, extending exactly the right proportions of wrist and cuff beyond suit sleeve, he grasped the chalk delicately between thumb and forefinger, and with an economy of effort, calmly progressed through his lecture. What a privilege to be in the presence of such a highly esteemed international reputation. In those days students weren’t given all the slides and notes on the internet to learn and parrot back in examinations. We used to read around lectures. We went to the library and made notes from text books and academic journals. We even owned quite a lot of expensive text books ourselves. So before long I worked out that what he had actually said was: “Ontogeny recapitulates phylogeny.” Furthermore, I understood what it meant: a chunk of lecture succinctly summarised in three words. The point is, as became clear when we later learned about how we acquire the power of speech and language, if we don’t understand something, if we cannot make sense of how the words fit together, we find it difficult to say. Think of the novelty song Mairzy dotes and dozy dotes and liddle lamzy divey. Twenty years later the children were laughing. “I bet you can’t say “Peter Piper picked a peck of pickled peppercorns,” said my wife, and recited the full verse, faultlessly. She followed it with “She sells sea shells …” as an encore. Within a few days my eight year old son had got it. “Ontogeny recapitulates phylogeny” he would tell anyone who would listen. At school, he was in Mr. Price’s class. “Aunty Jenny was late for what?” queried Mr. Price. That guy recently passed all his law exams. 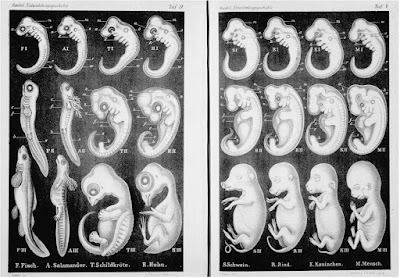 What a pity that Meckel and Serres’ theory of embryological parallelism, perfectly encapsulated in Ernst Haeckel’s catchy phrase, illustrated by his somewhat dishonest drawing and so urbanely recapitulated by Professor Clarke, has been discredited as biological mythology. 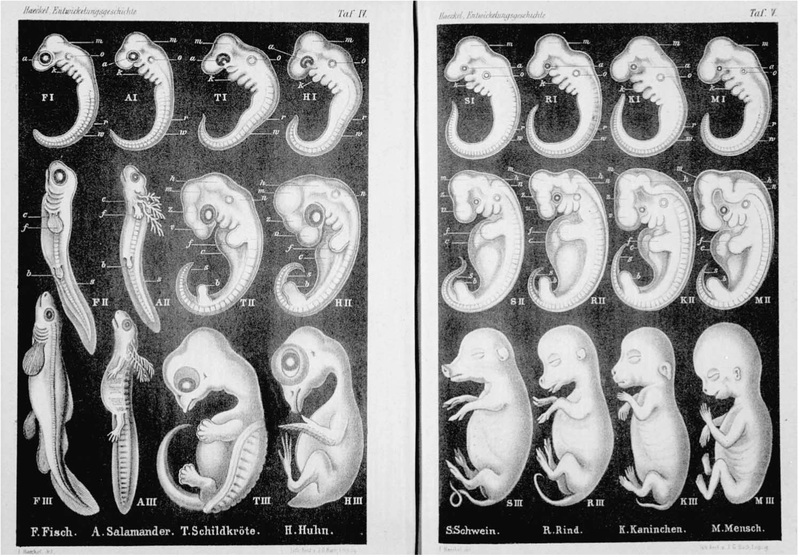 Haeckel's 1874 illustration of embryos is out of copyright.